Honor Show Chow Full Control is a high fiber, low energy textured feed great for maintaining show cattle in optimum show condition. The high fiber and fat level provides “fill” and “show bloom” exhibitors in a “holding” ration. This uniquely formulated, versatile ration offers flexibility in feeding program and can be fed to both heifers and steers. 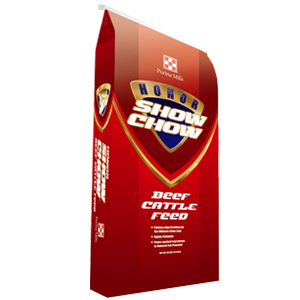 Gain Full Control of your feeding program today and try Honor Show Chow Cattle products! Honor® Show Chow® Full Control™ is designed to be fed at 2 to 3% of bodyweight per day. This feed is designed to “hold” cattle close to their targeted weight by reducing the amount of energy provided while still meeting the calf's need for protein, vitamins and minerals. If cattle have not been receiving a high-energy ration, Honor® Show Chow® Full Control™ should initially be fed at 5 to 7 lb. along with adequate quantities of roughage. Gradually increase the amount of Honor® Show Chow® Full Control™ until cattle are on full feed. A minimum amount of roughage (1 to 2 lb./hd/d) is recommended. Always provide plentiful fresh, clean water. DONOT FEED TO SHEEP DUE TO HIGH LEVELS OF SUPPLEMENTAL COPPER. Follow these management practices: 1. When making a ration change, allow 7-10 days for animals to adjust to the new ration. 2. Provide a source of fresh, clean water at all times. 3. Do not allow fine material to accumulate in feeders. 4. Provide adequate, well-protected and well-managed bunk space for each animal to prevent feed from becoming wet and moldy. 5. When fed from a self-feeder, adjust feederto minimize quantity of feed accumulating in trough. 6. Cattle should be vaccinated against enterotoxemia. 7. Consult your veterinarian forthe recommended health program for yourlocal area. This includes internal and external parasite control. 8. Provide plain salt and Purina Wind&Rain® All Season mineral free choice. In groups of cattle, there are certain animals that experience chronic bloat or other digestive disturbances, and consequently are poor performers. In addition, excess feed consumption, severe weather changes resulting in erratic feed consumption and poorly-managed feeding practices can increase the incidence of bloat in all cattle. If bloating does occur, the above management practices should be reviewed. Caution: Store in a dry area away from insects. Do not feed moldy orinsect-infested feed.